On Wednesday 17th December 2008, the National University of Ireland held an event to mark two special occasions: the 100th anniversary of the first NUI Senate meeting (17th December 1908, the year NUI and Queen’s University Belfast were both established by Charter) and the unveiling of the portrait of NUI Chancellor, Dr. Garret FitzGerald. 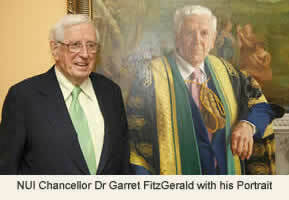 Dr FitzGerald was elected Chancellor in 1997 and will finish his term as Chancellor on 12th March 2009, on the election of a new Chancellor. Present at the double celebration were current and former members of the NUI Senate, and each attendee was presented with a handsome, specially printed copy of the Minutes of the 1908 meeting, which includes photographs and biographies of many of the members of the first Senate, including that of Reverend Dr William J Walsh, Archbishop of Dublin and first Chancellor of the NUI. 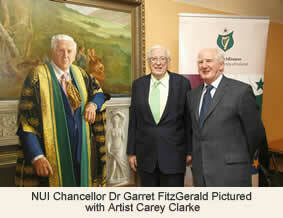 Dr. FitzGerald’s portrait was painted by the well-known artist Carey Clarke and was unveiled by Professor John G Hughes, Pro-Vice-Chancellor and President of National University of Ireland, Maynooth. 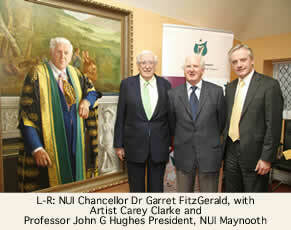 Professor Hughes remarked that it had been a ”privilege and a pleasure” to work with Dr. FitzGerald, and that the portrait was “due recognition of the enormous contribution” the Chancellor had made to the National University of Ireland. The portrait depicts Garret FitzGerald in his Chancellor’s gown, standing in front of a mantelpiece in the original Senate Rooms of 49 Merrion Square, to the backdrop of a section of the early nineteenth-century Italianate landscape murals which are unique to this building. The mural and the mantelpiece are very faithfully reproduced in the portrait. The artist stated that he felt privileged, both to paint the portrait and to be asked to paint it. He felt that the murals were a very appropriate background, and that the dancing figure depicted on the marble mantelpiece was also very apt as Dr FitzGerald had “danced his way” through a very full and distinguished life! Dr FitzGerald thanked Mr. Clarke for his patience and skill.